Runs, creates, edits, and deletes VBA macros through a dialog box (short for "visual basic for applications run"). Choose the name of a macro. Lists the names of macros found in the project file. Choose one to run. Lists the names of projects loaded into the current drawing. Choose one from the droplist. Describes the macro. You can edit this text. Opens the integrated development environment window. The macro is in debug mode, which runs one line of code at a time. Opens the macro in the integrated development environment window. The macro is in editing mode, which allows you to change the code. Notice the integrated development environment window. Enter VBA code. 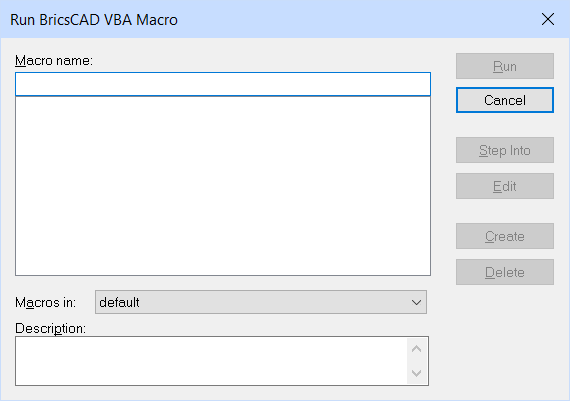 Are you sure you want to delete the macro - enter Y or N.
VbaRun - runs VBA macros.